Tonight Chaminade (3-0) faces Oaks Christian (3-0). 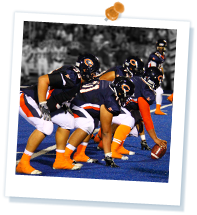 The Varsity football game will be featured on Fox Sports West’s Prep Zone Live, starting at 6:30 p.m. PDT. Kick-off at Booster Stadium (West Hills) is at 7:00 p.m.
Prep Zone Live viewers should click on the “Chaminade” game to watch the game online.